Retinal vascular occlusions (RVO) are a group of disorders interrupting the normal blood flow of the retina. There are two types of blood vessels which may become occluded, or stopped. Both retinal veins and arteries are affected. 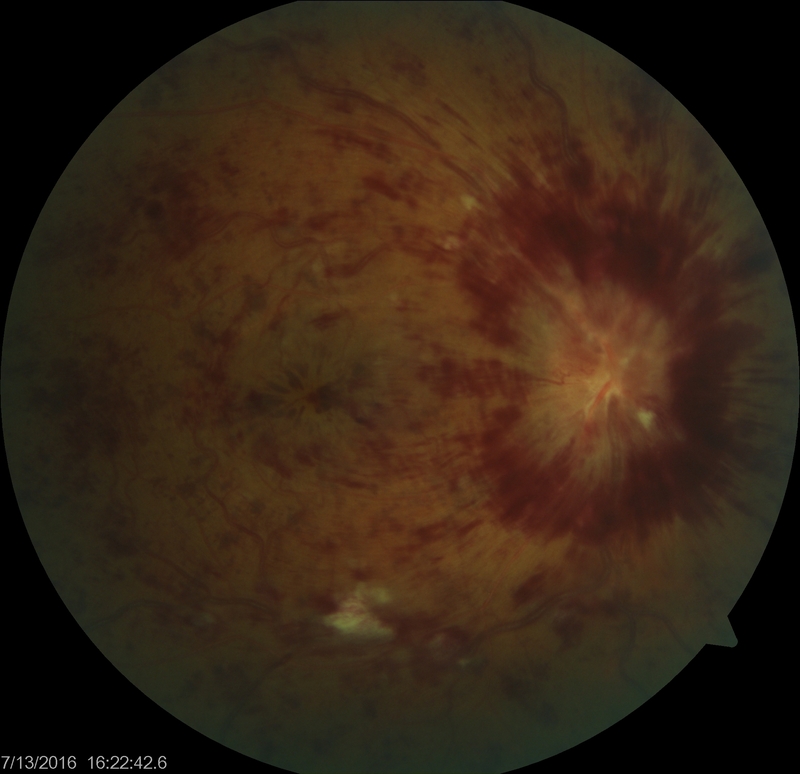 A central retinal vein occlusion is depicted in the featured image. The two differ by the amount of retina that is actually involved. A branch retinal vein occlusion is also known as a “hemi” retinal vein occlusion, hence, it involves 50% or less of the retina. The central retinal vein occlusion is larger and involves the entire retina. The visual prognosis is better for the BRVO compared to the CRVO. As with vein occlusions, the distinction between BRAO and CRAO is the amount of retinal tissue involved. Artery occlusions generally have a worse prognosis compared to vein occlusions. In addition, an artery occlusion may be a sign of more serious cardiovascular/systemic disease. All types of occlusions share the same symptoms. The most common symptoms of retinal vascular occlusions (RVO) are sudden, painless loss of vision. It happens very quickly. The best way to diagnose the type of retinal vascular occlusion is to see your eye doctor or retina specialist for a complete dilated eye exam. Additional testing including digital fundus photography, optical coherence tomography (OCT) and fluorescein angiography may be necessary. Generally speaking, vein occlusions (both BRVO and CRVO) are caused by hardening of the arteries. Though these are soft veins, retinal veins and arteries cross over one another. At these intersections, the harder artery can press against the softer vein causing closure. Artery occlusions are quite different. Usually a piece of cholesterol plaque can break off, usually from the carotid arteries of your neck, travel to the retina and plug a retinal artery.